The NBA 2K series has prided itself on nailing the nuances of basketball like arguably no other video game. So when I was given hands-on time with NBA 2K12, all of the subtle gameplay refinements created a level of immersion few sports titles have attained. My hands-on session began by taking a trip down memory lane in NBA 2K12's Legends Mode. 2K once again nailed the presentation, opting for a black-and-white, grainy broadcast instead of color for the games that were played in that era. The announcers also had an old-school radio broadcast sound for the games that took place in the 50s and 60s. The in-game overlays even provided more than just the legends' stats -- in one instance letting the viewers know that Bill Russell received the President's Award during his illustrious career. Presentation aside, the aspect that really stood out was the improved AI. In past years, AI controlled players weren't too committed to moving without the ball unless you called a specific play. 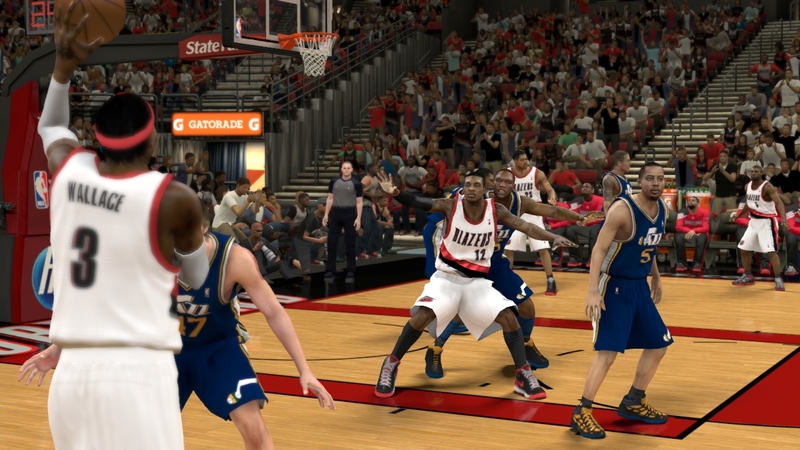 In 2K12, players are intent on getting to the spots where they can succeed. Hakeem Olajuwon would work to get position in the post to pull off his patent Dream Shake. The '85 76ers set a screen under the basket for Moses Malone to get him deep, low-post position. When I pitted the current Warriors against the Showtime Lakers, James Worthy and Magic Johnson continued to try to post up Golden State's smaller backcourt of Monta Ellis and Stephen Curry. These instances turned each possession into a chess match. The improved AI is also felt on defense. Dumping the ball to Patrick Ewing would cause the opposing team to send help from different spots on the floor, but the AI never over-committed, opting to fake the double-team attempt and go back to their man. This realistic defensive tactic made it difficult to know when to pass or continue to post up. Defensive rotations have also undergone an overhaul. The AI does a better job of disguising where they will bring help, creating more unpredictable defensive sets. The AI also defends passes better, more eager to jump passing lanes or tip a pass to create a fast-break opportunity. The developers have also upped the realism on the court. Ball handlers who use a burst of speed will bounce the ball a little ahead of themselves to recreate how players dribble when changing speeds. The ball itself is more live this year. Going for rebounds is much more unpredictable because players will tip the ball off the backboard or off themselves while battling for the ball. Celtics legend John Havlicek dribbled the ball off his leg trying to get to the middle of the floor while surrounded by defenders. This addition will make players more hesitant about trying to dribble through traffic because they might not escape with the ball. Midair collisions are also prevalent during drives to the rim. These encounters, while mostly subtle, force you to change your shot and affect your success rate. The collisions also increase the variety of shots taken close to the rim, keeping the play fresh around the basket. One of the most critical tweaks near the rim has to do with the post-up game. Initiating a post-up is now mapped to the "Y" button (or triangle on PS3). This change makes the post game feel more fluid, allowing to easily pull off more up-and-under moves and head fakes. It also gives the player the freedom to post up from any spot on the floor. Another area that has been overhauled is play calling. Though the playbook has been pared down from more than 1,0000 plays to about 400, the addition of multiple branches breathes new life into the system. In NBA 2K11, when the AI would call a play, it would be easy for veteran 2K players to sniff out the play and intercept the pass because they had seen the play run numerous times. In 2K12 there will be multiple branches for each play, which allows the AI to adjust the play at different times while the play is occurring. So the AI will recognize that you are trying to overplay a certain area of the floor and go to a different offensive option during a set play. Calling plays has also been redone with the addition of play initiators. Last year, only the point guard could start a set play but for teams like the Miami Heat or Los Angeles Lakers, this was not realistic. Play initiators are a specific number of players on each team who will have the ability to call plays, so even though LeBron James does not play point guard, he will be able to start a play. All of these tweaks and additions have NBA 2K12 ready to make another run at sports game of the year awards and the developers still haven't divulged any information about the game's more popular modes - Association, My Player. Check back for more updates as the game prepares for its Oct. 4 release for PlayStation 3, Xbox 360 and PC.